SALE! 20% off all Rain Chaser raincoats. Thank you for being a Blue Willow Customer! Let's make a coat. "the best coat we have ever seen"
"We can finally play outside in the cold Iowa winters!" Every dog coat is custom made and built to last. A perfect fit, plus your choice of many fabrics and options. 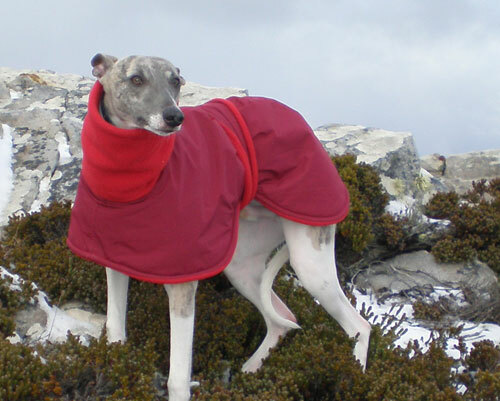 Modern Waterproof/Breathable fabric exterior and thick Polartec® fleece lining on winter coats and raincoats. 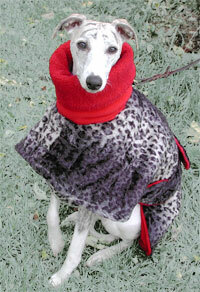 We make winter coats and raincoats for all dog breeds, from chihuahua to great dane. See photo gallery. Warm up your chilly pup! Ordering a dog coat is easy: on the web or by mail/phone. More dog supplies are here! 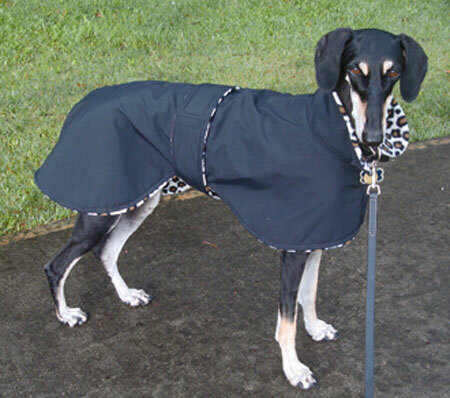 Saluki Pearl will stay comfortably dry in her Hawaii home with her lovely black and leopard Rain Chaser waterproof dog raincoat! 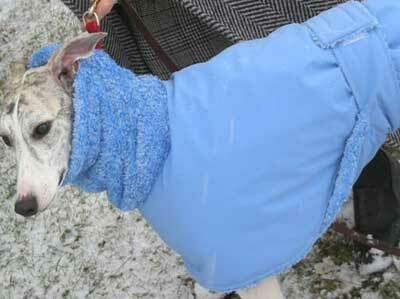 Nambe stays warm in the Falkland Islands with his Snow Angel winter dog coat. Here's one beautiful Rhodesian Ridgeback in a Snow Angel winter coat, with black Gore-tex outside, camel Polartec fleece inside. 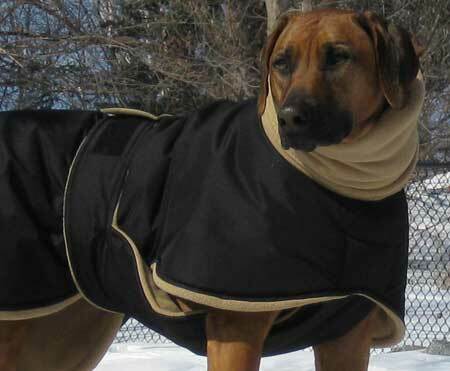 Despite the Ridgeback's large tail, this coat is styled in the English (over-the-rump) style for maximum warmth. 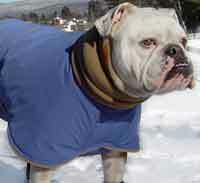 There is also an extra-long turtleneck collar. 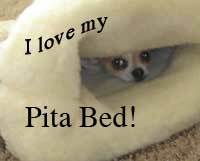 Visit Blue Willow on Facebook for deals and announcements! for such a gorgeous and warm coat!" the Diva being cold when wearing this!" "Sharon: The coats arrived today and they are WONDERFUL!!!! Thanks so much for the exquisite quality!"